It&apos;s summertime in Austin, and there&apos;s no greater place to be! Summers here mean rooftop patios, refreshing foods, drinks and happy people. But it also means heat. 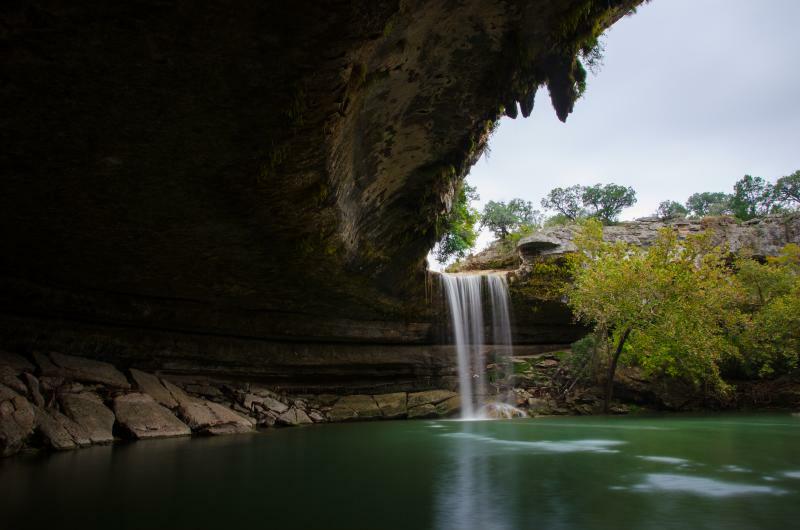 Sometimes an air-conditioned room or ceiling fan just isn&apos;t enough, so RootsRated has been on the search for the best swimming holes in Central Texas to help you beat the heat. Hamilton Pool. Credit Leon Bovenkerk, courtesy of RootsRated. In the heart of Zilker Park, minutes from downtown, lies this 200 yard swimming paradise. Barton Springs Pool features year round, 68-degree, clear water, deep diving and shallow areas for the kids and grassy hills for sunbathing. You name it, this park has it and everyone knows it so get there early if you can. Open 5 a.m.-10 p.m. Admission: $3. Closed 9 a.m.-7 p.m. on Thursday for cleaning. Much like Barton Springs, the water at Krause Springs is a constant 68 degrees and flows continuously from its source even during the current Texas drought. This is a private park outside the city, so it is slightly less crowded and is strictly maintained as a natural oasis. In addition to swimming, you can camp overnight, bring a boat, and enjoy other activities that are more difficult right in the city. The 40-minute drive from downtown to Spicewood is well worth it. Admission: $7 for adults, $5 for kids. A 40-minute drive from town takes you to another world. One of the most inviting geological phenomena of the Texas Hill Country, Hamilton Pool provides excellent hiking and trail running trails, as well as a stunning swimming hole with a fifty-foot waterfall.The water is nice and cool for swimming, but be sure to check their website to make reservations (required in advance) and to check water quality, as sometimes after-rain pollution spoils the show. Open 9 a.m.-6 p.m daily. Admission: $10 per vehicle. Situated on 100 acres of prime Lake Travis shoreline and about 20 minutes from downtown, Hippie Hollow is your best (and only) legal public clothing-optional option in Texas and offers plenty of quiet space for skinny dipping, as well as great trails for hiking. Travis County does prohibit anyone under 18 from entering. Open 9 a.m.-Civil Twilight. Admission: free. The San Marcos Rive is one of the most unique rivers in Central Texas and is part of one of the longest paddle routes in the United States.Its great for paddling, including some whitewater after a good rain, but when the waters moving slower, it&apos;s definitely a top swimming destination, with lots of holes to find. Open daily. Admission: free. For a guide to more outdoor destinations around Austin, check out RootsRated Austin. Also for a deeper dive into swimming holes around town, here&apos;s our guide for the 10 Best Swimming Holes In Central Texas. Contributed by Dave Brown, RootsRated Austin Staff Writer.